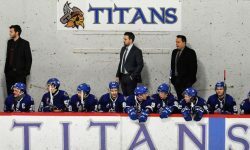 The Temiscaming Titans will begin the 2015/16 season in defense of their Russell Cup with a minor change behind the bench. Sharing the duties of head coach will be Andre Laperierre and Chris Levesque. Laperierre was the bench boss for the Titans for 2012/13 and 2013/14 seasons and led the Titans to a record of 69-11-4 over these seasons. The Titans made the finals and semis in these years. Laperierre started the 2014/15 season with the Bracebridge Blues but left early in the season. He will be joined on the bench by Chris Levesque. Levesque played three seasons for the Titans and has seen his jersey retired. Chris was one of the assistant coaches last season and contributed to the Titans success and eventual winning of the Russell Cup. With Andre and Chris, the Titans look to repeat as champions in 2015/16. Both coaches are fairly young but bring some enthusiasm to the room and behind the bench.